Course and session evaluations are popular assessments for helping to improve course and instructor quality at conferences and in learning programs all over the world. One of our major goals over the past few years has been to make it easier to create and deliver course evaluations – and to help organizations glean more meaningful, actionable results from them. Back in 2010, when we added the ability to author course evaluation surveys in Questionmark Live, we included question libraries to draw from in creating surveys. These libraries cover four topics: Demographics, Instructor, Course Materials and Facilities; you can either write your own questions or choose some from the libraries. More recently, we’ve been exploring the use of QR codes to increase course evaluation response rates by taking participants directly to online surveys via their mobile devices. Go here and here for more details about the benefits of using QR codes. What about the results of course evaluations? We now have 4 course evaluation surveys in Questionmark Analytics: Course Summary, Instructor Summary, Class Summary and Class Detail. The four course evaluation reports allow you to drill into more and more detail about your course evaluation results. You can start at the course level and work your way down to an instructor/question level of detail. Each report also has visual cues to make performance obvious with a quick glance. 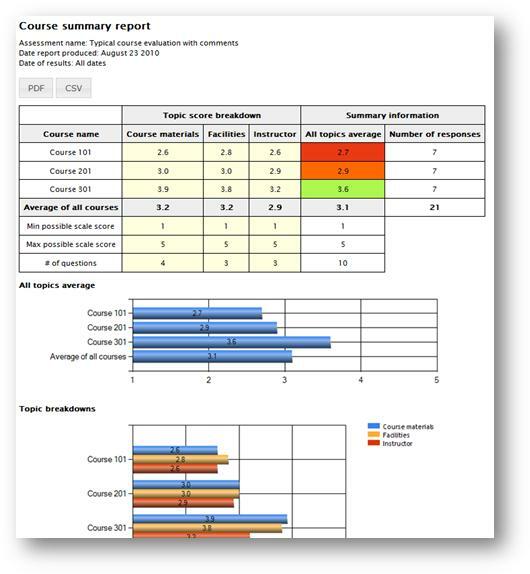 In the example below, the course summary report compares evaluation results across courses. It is most useful for managers and supervisors to comparing different courses within an organization. If you are a customer looking to improve your course evaluations, you can click here to read for our Course Evaluation Best Practices Guide. Anyone who hasn’t used Questionmark Live can sign up for a free trial via our Tryouts and Downloads page.